Exterior Overview of Classic Home 071, Howard House, by MacKay-Lyons Sweetapple Architects. This four-bedroom, two-bathroom coastal house near Halifax, Nova Scotia, Canada sits alongside a small cove, less than 10 feet (3 meters) from the shore. Measuring 12 x 110 feet (3.7 x 33.5 meters) and finished in corrugated metal siding, this house has been mistaken for one of the many boatsheds that dot the local coastline. 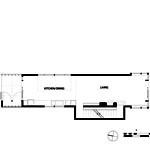 The main living spaces are on the middle of three floors, with an entry and covered breezeway to the north serving as a transition between the living area and the garage. Large sliding barn doors can be used to enclose the breezeway during inclement weather. The living room lies at the southern end of the house and opens onto a partly cantilevered patio. The three walls at the end of the living room are glazed to provide an impressive, wide angle view of the coastline and sea. 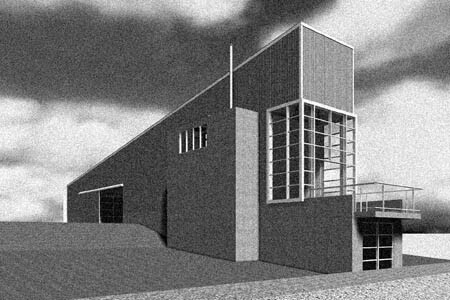 A concrete stairwell along the long western facade is the only element that interrupts the otherwise simple, rectangular shape of the house. The stair and indeed the entire house are oriented to resist a strong prevailing westerly wind. Large internal steel trusses also help the house bear the wind load. 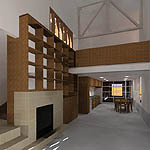 The house features a variety of lower-impact energy strategies, including radiant floor heat, passive ventilation, and passive solar collection with carefully placed thermal massing. On the lowest floor, three bedrooms and a bathroom are connected by a small hallway. 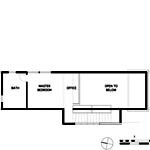 The upper floor is open to the living space below and contains an office area and master bedroom suite. Copyright Notice: The design of this house is owned by the designer, and it may not be copied without permission.